I kind of try to avoid talking about my personal life on Sandwichtalk, but I was recently hired by the Kalamazoo Gazette as a news section intern (you can see my work here). One of the effects of this job is that for the first time, I’m in downtown Kalamazoo between the hours of 11 and 3, when the hot dog shop Dogs With Style is open. Dogs With Style is a bit of a rarity in this day and age; a cheap lunch option with limited hours and a menu of hot dogs and other quick sandwiches, french fries, and a couple of soups. Seating is limited, and they actually have a walk-up window outside to the street. 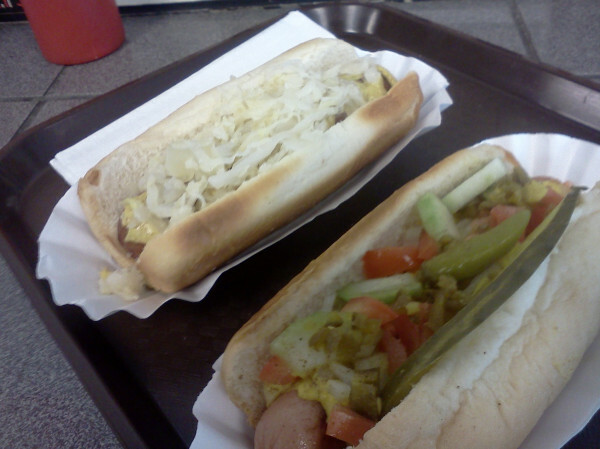 The Polish Dog on the left, and the Chicago on the right. 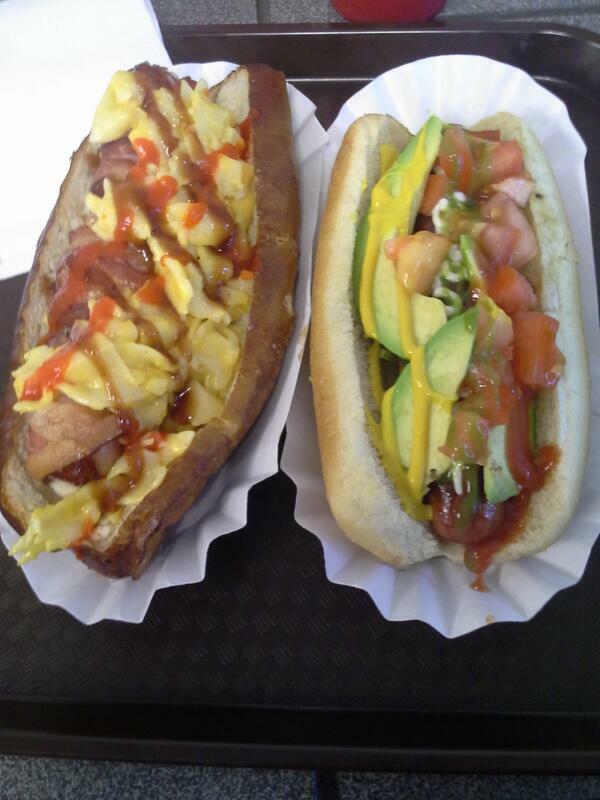 I ordered the Chicago Dog and the Polish Dog, and was impressed by both. The Polish was a bratwurst with sauerkraut and spicy brown mustard. It was good, and both the bratwurst itself and the sauerkraut were generously portioned. I had tried a Chicago-style hot dog previously but hadn’t been too impressed with it. This one was much better. 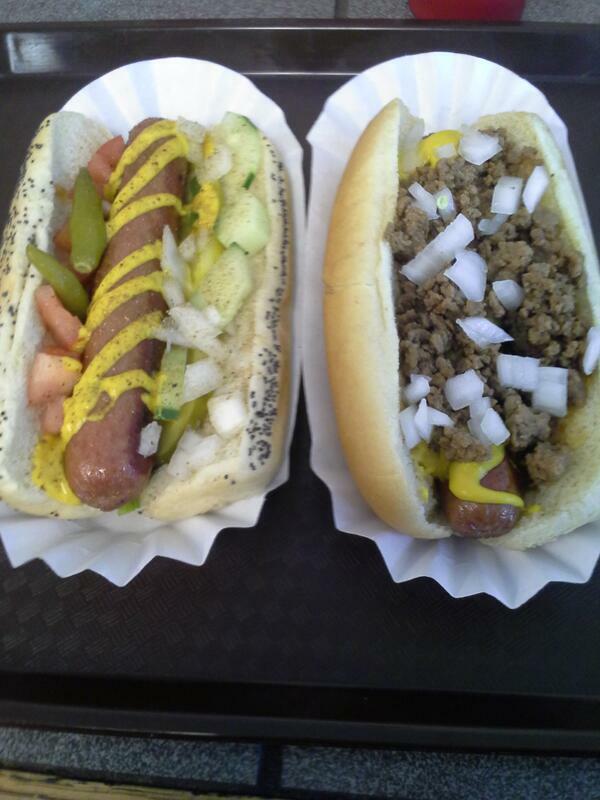 The inclusion of celery salt was a small but important addition, and while the hot dog frank itself wasn’t quite on the level of Steak ‘n’ Shake’s, the other ingredients, namely the chopped onions and tomatoes, tasted fresher and much more authentic. While I’m still warming up to Chicago-style, this is obviously the place to do it. All of the hot dogs and most of the sandwiches at Dogs With Style cost $2.50. You can get a cheap combo, which includes fries and a drink, but the two hot dogs themselves made a pretty satisfying lunch. Dogs With Style is on Burdick Street next to the Kalamazoo State Theatre, and if you happen to be going to lunch downtown, it’s a good bet.